I was making blocks for my Mod-Mod Queen-size quilt, decided to use a striped fabric for some of the Flying Geese units .. and I decided I wanted the stripe to go the same way in all the blocks, which it wouldn’t if used the 4-at-once, no-waste technique in Method #1, or made them as half-square triangles as in Method #2. At first I thought I’d paper-piece them (Method #3 in the block directions), but it just seemed a lot faster if I could chain piece all the HST and find a way to piece them. So I made a template for that big triangle. I printed the foundation pattern and cut out the triangle, adding a quarter-inch seam allowance all the way around and sticking it to some lightweight cardboard with a glue stick. Starting with a 4-inch strip of the stripe fabric, I cut one right-side up and then one upside down along the strip. For the “sky” portion on these flying geese units, I cut 4 3/8 inch squares and sliced them diagonally, sewing one on each side. You do have to be gentle because you are working with bias edges, but it worked pretty well for me. It made me think about how sometimes the method/technique you choose will depend on the fabric you’re using. Here are the blocks I made with the striped geese and four more blocks, made using the process in Method #1 for the total of nine I need for my quilt. Very Neat Sophie! I had tried the striped fabric last month with the 4 at once method. I ran into 10 with stripes the way I wanted and 10 with stripes going sideways on my first try. Luckily I was doing Lap quilts for men and using earth tones so the (wrong ones) became really neat mountains up one side of various masculine printed centers… The quilts were asymmetrical and very cool. I really enjoyed making them. 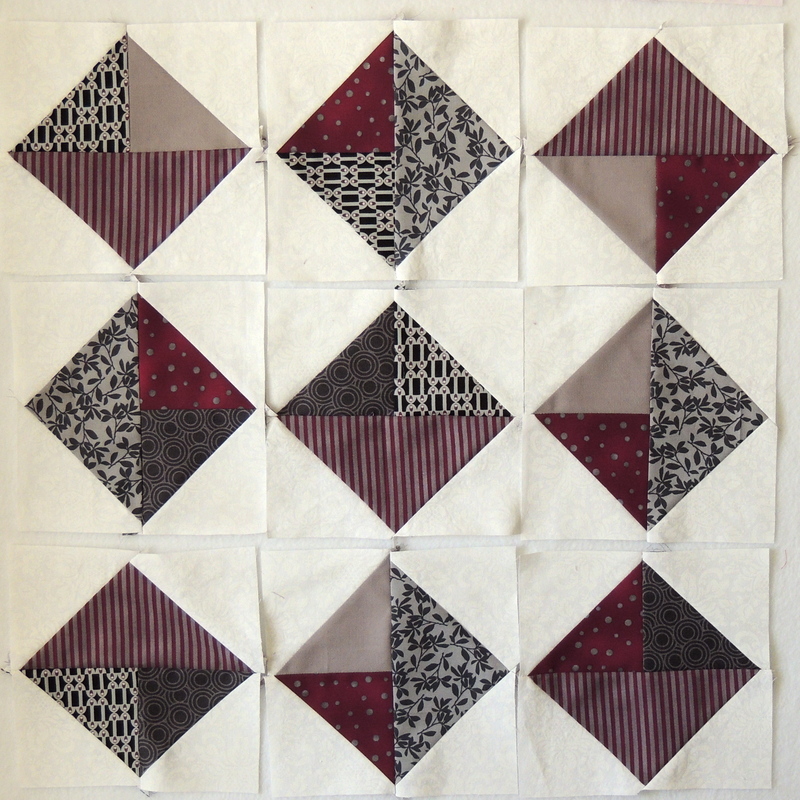 Sophie I can’t seem to find the requirements for this months blocks for my Mod Mod quilt…I am doing a Queen. Where do I look? You can find the chart with the number of blocks you need to make at the bottom of the March 1 announcement post: Triangles in a Square is the April Block. I’ll post the layouts with my notes and suggestions next week, mid-month on the 15th.